Jessica Campbell, Blue Sky, 2018.The Brutal Telling, 2018. Nirvana, 2018. Edge of the Forest, 2018. Chicago Works: Jessica Capmbell is the first solo museum exhibition of Chicago artist and cartoonist Jessica Campbell, whose candid, often humorous textiles, comics, and drawings critique the traumas and absurdities of gender politics. For her Chicago Works exhibition, Campbell re-envisions the life and artwork of Canadian painter Emily Carr (1871-1945), celebrated for her expressive landscapes, to explore the sexism women face in everyday settings and the creative possibilities of reading and telling stories from multiple perspectives. Chicago Works: Jessica Campbell is organized by MCA Curatorial Assistant Nina Wexelblatt and runs from December 18, 2018 to July 7, 2019. Inspired by their shared roots in Victoria, British Columbia, Campbell presents a new suite of work engaging with the life of Emily Carr. 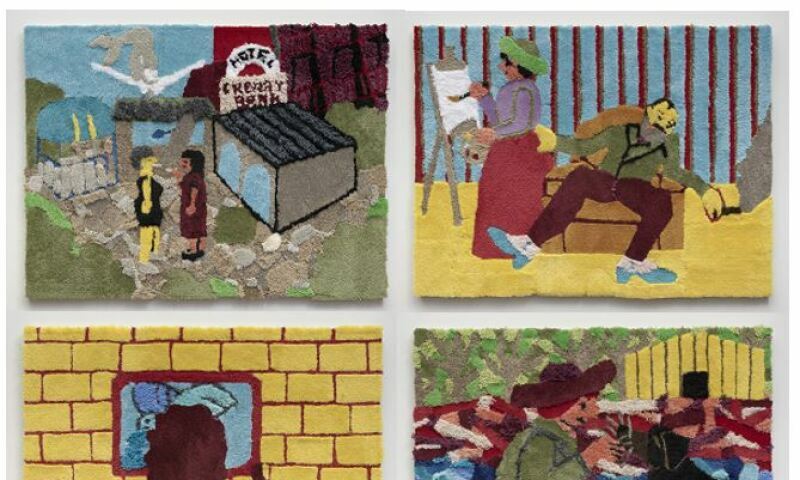 Campbell approaches Carr's work through a feminist lens and across a range of media--from paintings and drawings to comics and textiles--to show the ongoing presence of seemingly distant art histories in the present day.